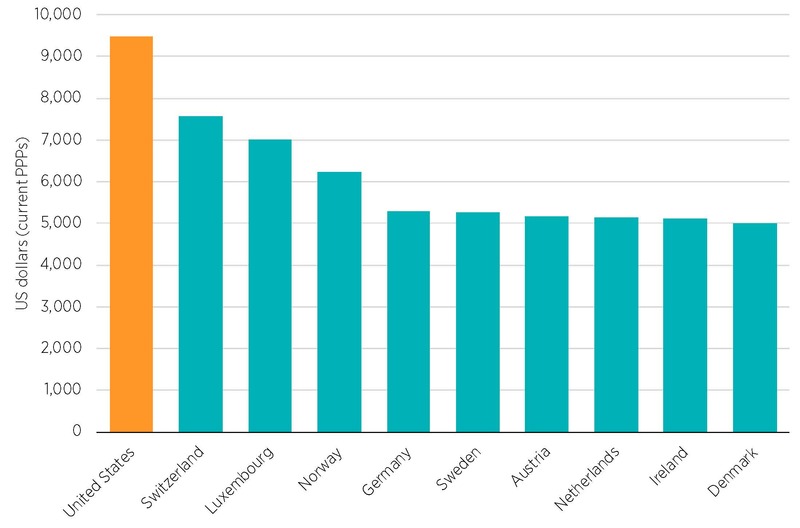 The United States leads the world in per capita healthcare expenditures, spending 25 percent more than Switzerland, which ranks second (see figure 1). But health outcomes in the United States are not good enough to justify this difference. Spending more without getting more in return suggests waste. In a 2013 report, the Institute of Medicine (now the Health and Medicine Division of the National Academies) estimated the waste in the US healthcare system at $750 billion. In any other industry, entrepreneurs would jump at the opportunity to turn waste into profit. In healthcare, however, regulations and payment laws make it challenging for entrepreneurs to introduce cost-saving innovations or to reinvent service delivery. One of the main barriers to innovation comes from Medicare’s reimbursement system: providers are paid on a fee-for-service basis, meaning that those providers who would achieve quality health outcomes using fewer services receive less revenue than providers who do not engage in such innovation. In order to eliminate these perverse incentives, patients need to be empowered to make their own healthcare purchasing decisions and to be able to benefit from shopping for a better value. Share this Facebook TwitterSource: OECD iLibrary, Health Expenditure Indicators (dataset), accessed October 4, 2018, https://doi.org/10.1787/data-00349-en. Cincinnati Children’s Hospital took up the challenge of building an innovative model under conditions in which patients are empowered, and was able to improve quality while decreasing costs, despite large regulatory burdens. In the 1990s, its CEO and board of directors approved a strategy to improve quality across its operations. As a result, the hospital went from offering below-average care to reaching the top 10 percent of the nation’s providers. While this improvement was a net benefit for patients, the finance department of the hospital warned that the reduction in medical errors and services provided was going to result in revenue losses. Indeed, under the current payment system, payment depends on input volumes, not on the quality of outputs. However, the hospital was able to admit more patients thanks to shortened average patient stays. As such, Cincinnati Children’s Hospital was able to make quality improvements and generate higher revenues through the admission of more patients. Unfortunately, given the nature of the healthcare industry, such strategies cannot be implemented by providers profitably across the board. Take the example of Duke Hospital Medical Center. Similar to Cincinnati Children’s Hospital, its specialized congestive heart failure program undertook to improve quality while reducing costs. Thanks to better health outcomes, fewer patients needed to be admitted into the hospital, which translated into the average cost per patient going from $21,500 to $12,900, representing a 40 percent decrease. This, however, effectively reduced the hospital’s revenue per patient, leading the program to lose money. The bottom line is that as long as the payment mechanism is heavily influenced by Medicare, providers will continue to design their operations based on perverse incentives, where profit increases with the number of procedures performed and decreases as a function of patient health improvement if the improvement results in using fewer inputs. Imagine eating at a restaurant and being force-fed a seven-course meal, only to be charged five dollars for it. You were certainly fed, but you ate more than you needed, it cost more than you were willing to pay, and someone else picked up a large portion of the bill. In more ways than one, the healthcare system presents similar characteristics: the server of each course—in this analogy, the provider of each medical service—receives compensation based on the number of procedures performed, and receives that compensation primarily from third-party payers—in this analogy, the government and private insurers. As for the patient, she has little to no say in the matter and little incentive to seek out alternatives, given that her out-of-pocket payment is low. The restaurant analogy reveals a straightforward solution: the customer should be empowered to select the provider of her choice based on the value she is looking for and bear the financial consequences of that choice, mitigating the impact of large expenses through savings and health insurance. In 2017, the nearly 122 million Americans who were on government-financed insurance had access to a restricted pool of providers and bore a small proportion of the cost of the healthcare services they consumed. For individuals to regain control over their health service consumption and spending, they need to be in charge of the way funds dedicated to healthcare services are spent on them, and they need to be able to benefit if spending is reduced. Instead of reimbursing providers on a fee-for-service basis, the government should allow Medicare beneficiaries to spend the funds allocated to them on the healthcare services that the beneficiaries themselves deem necessary. This ability for individuals to be in charge of their healthcare purchases would in turn give an incentive to healthcare providers to innovate so that they can lower their prices and increase quality. The best providers will attract patients and achieve high growth, and sub-par services will be phased out. Innovation will thus be rewarded and patients will enjoy the quality care they need at a price they can afford. When providers like Cincinnati Children’s Hospital and Duke Hospital Medical Center manage to decrease costs and improve quality, everyone should win: patients, hospitals, insurers, and taxpayers. But as long as payment is correlated with the number of procedures performed without regard to the quality of medical outcomes, innovative providers will continue to face perverse incentives. The way forward includes putting the patient in charge of her healthcare service purchases and letting her favor those providers whose value offering matches her needs and means. These points were borrowed from a research paper by the author. See Marta Podemska-Mikluch, “Understanding Medicare’s Impact on Innovation: A Framework for Policy Reform” (Mercatus Research, Mercatus Center at George Mason University, Arlington, VA, 2018). Anita L. Tucker and Amy C. Edmondson, “Cincinnati Children’s Hospital Medical Center,” Harvard Business School Case 609-109 (June 2009, revised April 2011). David M. Cutler, “Where Are the Health Care Entrepreneurs? The Failure of Organizational Innovation in Health Care,” Innovation Policy and the Economy 11, no. 1 (2011): 1–28. Gary Wang, “Treating Congestive Heart Failure at Duke: A Case Study of Delivery and Payment Reform,” Duke Center for Research on Personalized Health Care Blog, March 21, 2017. US Census Bureau, Health Insurance Coverage in the United States: 2017, September 2018.